In this debut book on women’s health, Citrin (Fatal Error, 2010), a breast cancer specialist at Cancer Treatment Centers of America, provides an easy-to-follow, no-nonsense explanation of cancer detection and treatment. Citrin’s primary goal is to convey the seriousness of breast cancer without striking an alarmist tone, and as a result, he acknowledges that misunderstandings and a lack of communication often prevent women from receiving proper treatment. “I believe the main reason women delay seeking treatment is fear,” he says. “Some women deny the presence of cancer, others refuse treatment, and many are not appropriately educated about their cancer or given the opportunity to completely understand their condition and the options before them.” The book guides readers through basics, including the biology of breast cancer and the usefulness of diagnostic techniques from mammogram to biopsy. Citrin, a veteran physician, then proceeds through an explanation of cancer treatments, with particular emphasis on recent developments that produce more effective and less debilitating results. He advocates an integrative approach to treatment as the best way for patients to make informed decisions and receive the most accurate, effective care. The driving theme throughout the book is one of empowerment, as Citrin counsels patients to continue asking questions until they feel fully informed; he chastises doctors who dismiss patients’ beliefs or wishes and lay out treatment plans in impenetrable jargon without ensuring that patients understand and agree. While the tone is generally upbeat, focusing on the fact that properly diagnosed breast cancer is nearly always treatable, the book does not shy away from acknowledging that complicating factors exist, and a concluding chapter goes into detail regarding situations that require a more careful approach, from genetic risk factors to breast cancer in males. Throughout the book, patient stories offer concrete examples of the topics discussed, serving as examples of different stages of progression and the varying levels of success. Appendices offer further resources, including a glossary and a comprehensive list of questions patients should ask their doctors. 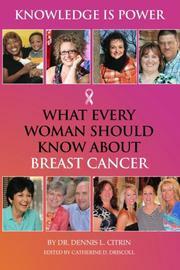 A balanced, reassuring guide to managing breast cancer through information and empowerment.